Stocks made a huge comeback on Thursday, rallying after tragic news out of the UK and erasing an early-morning sell-off. Tragedy struck the UK on Thursday as Labour Party MP Jo Cox died after being shot and stabbed near the northern city of Leeds in West Yorkshire. According to eyewitnesses, the assailant shouted “Britain first!” while attacked the MP. It’s unclear if this was a reference to the far-right Britain First political party. Cox was a part of the “Stronger In” campaign advocating that Britain vote to stay in the EU in next Thursday’s referendum. Market action following reports of Cox’s death suggest this tragedy is being viewed by financial markets as bolstering the case for the ‘Remain’ camp in next week’s referendum, with the British pound rallying through the afternoon in New York after having tumbled earlier in the day. 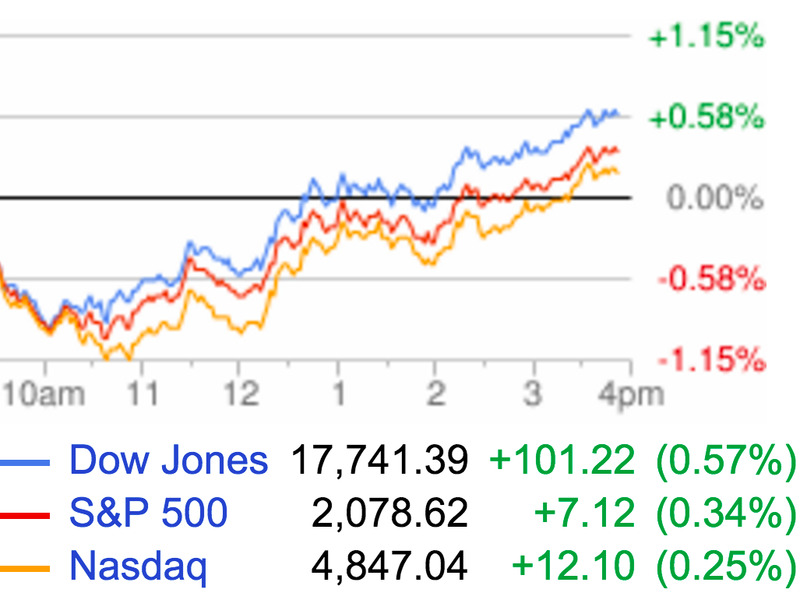 US stocks, which had been lagging, rallied sharply higher and finished near their best levels of the day. Thursday was the week’s busiest for US economic data as readings on the manufacturing and housing sectors, as well as data on the labour market and inflation all crossed the tape Thursday morning. The day’s biggest economic report was the latest consumer price index, which showed “core” consumer prices rose 2.2% over the prior year in May, in-line with expectations and showing that prices excluding food and energy continue to pick up a bit of steam. Headline consumer prices, which include food and energy, rose 0.2% over the prior month. Inside this report we also got data continuing to show that rent inflation — or owners’ equivalent rent — continues to accelerate, with the shelter index rising 0.4% month-on-month in May, the biggest gain since February 2007. The Philly Fed’s latest manufacturing survey showed activity expanded faster than expected in June, with the reading hitting 4.7, up from a -1.8 reading last month and better than the 1 that was expected by economists. The weekly report on initial jobless claims showed initial filings for unemployment insurance totaled 277,000 last week, more than the 270,000 that was expected but still well below the 300,000 number some economists could indicate a more significant loss of momentum in the US labour market. Homebuilder sentiment rose to 60 in June, better than the 59 reading that was expected and bringing this gauge to its highest level since January. Business Insider markets reporter Bob Bryan is bearish. Or at least, the analysts he’s reading are bearish. Very bearish. In two posts out Thursday morning, readers learned that both a “black hole” and potential repeat of one of the worst financial periods in US history pose threats to the markets. BNP Paribas economist Paul Mortimer-Lee wrote in a note to clients that the downward march in bond yields suggest a “black hole”-style gravitational force is sucking bond yields lower across the globe. And, well, black hole or not, something is dragging these yields lower. “It seems to us that signs of US economic weakness are behind the shift in bond yields, aided and abetted by the failure of the Chinese economy to respond significantly in the upside following major stimulus,” Mortimer-Lee said. This runs counter to another popular theory that central bank influences are pushing bond yields lower. The thing is: both can be (partially) true. So, either way. Elsewhere in scary commentary, analysts at Morgan Stanley say the US is currently risking a repeat of 1938, which saw a massive recession triggered by too-tight monetary policy from the Federal Reserve as the US economy emerged sheepishly from the Great Depression. “The critical similarity between the 1930s and the 2008 cycle is that the financial shock and the relatively high levels of indebtedness changed the risk attitudes of the private sector and triggered them to repair their balance sheets,” write Morgan Stanley global strategists Chetan Ahya, Elga Bartsch, and Jonathan Ashworth. And look, the 1930s comparison has been made before. In a way, it makes sense: the 1930s followed the Great Depression, and the financial crisis was the worst thing to happen to the US economy since the Great Depression. Also, the 1930s saw a Fed get too aggressive when the economy was weak. But is that really happening now? I mean, it’s possible. But really, this idea is just, well, an idea. This all, in my view, is another way of saying growth and confidence are good while no growth and fear, mixed with a little too much debt, is bad. None of which is that exciting. PIMCO is cutting about 3% of its staff and offering buyouts to others. The ‘next housing crisis’ could be a lot worse. All the oil market disruptions we’ve seen in 2016 in one chart. Viacom’s CEO has been kicked off its board by Sumner Redstone. A big insurance firm was downgraded because of Lynn Tilton.